Developed by researchers and designers specializing in typography and behavioral science, Sans Forgetica is a new font designed to help readers better remember the information they read by forcing them to spend a bit more time on each word. The design of Sans Forgetica is based on a font called Albion, but with substantial modifications to reduce familiarity and attain its goal of engaging the brain more and helping the reader retain more information. It was developed by scientists at RMIT University in Melbourne, Australia, who believe it could help students studying for exams. “We believe this is the first time that specific principles of design theory have been combined with specific principles of psychology theory in order to create a font,” Behavioral economist Jo Peryman told DW. If fonts are too familiar, readers often glance over them without their brain creating any memories of what was read. At the same time, if a font is too outlandish, the brain has to struggle too much to decipher it while neglecting the retention of information. 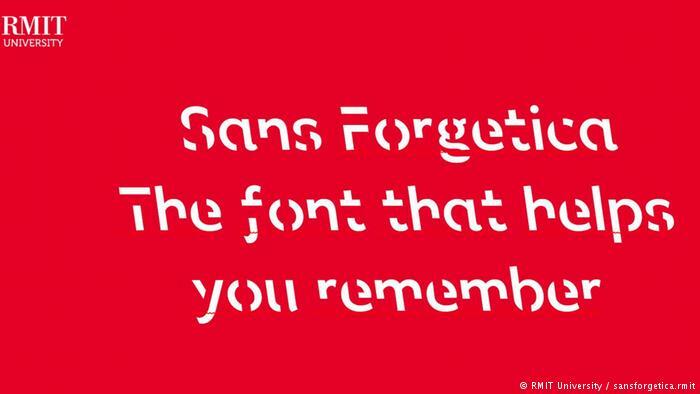 According to its developers, “Sans Forgetica lies at a sweet spot where just enough obstruction has been added to create that memory retention.” Its modifications force readers to spend more time, but not too much time, reading each word, allowing the brain to engage in deeper cognitive processing. So does Sans Forgetica actually work? Does it help readers better remember the information they read. So far, studies have shown that it can make a difference, albeit not a significant one. One experiment had 96 participants recall word pairs presented in three different font. They remembered 69 percent of the word pairs written in Sans Forgetica, compared to 61 percent for the other fonts. In a different experiment, 303 students took a mock multiple-choice exam, and whenever the text was presented in Sans Forgetica, they remembered 57 percent of the text, compared to only 50 percent of the surrounding text written in Arial font. So Sans Forgetica won’t give you the memory of an elephant, but if you’re the kind of person who believes every little bit helps, it might be worth a try.